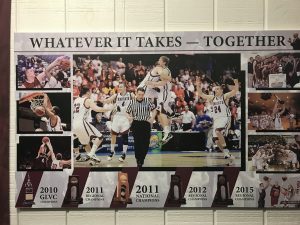 I am going to make a bold prediction: Bellarmine earns 2nd National Title in less than 45 days because this team may not have the star power of the previous, led by Braydon Hobbs and Jeremy Kindle, but this team may even have more depth, greater talent distribution, two top GLVC players (Number 5 Guard Rusty Troutman and Number 1Forward Adam Eberhard), and the love of each other that you can rarely find in college sports and the secret sauce that defines “mastery of confidence”! 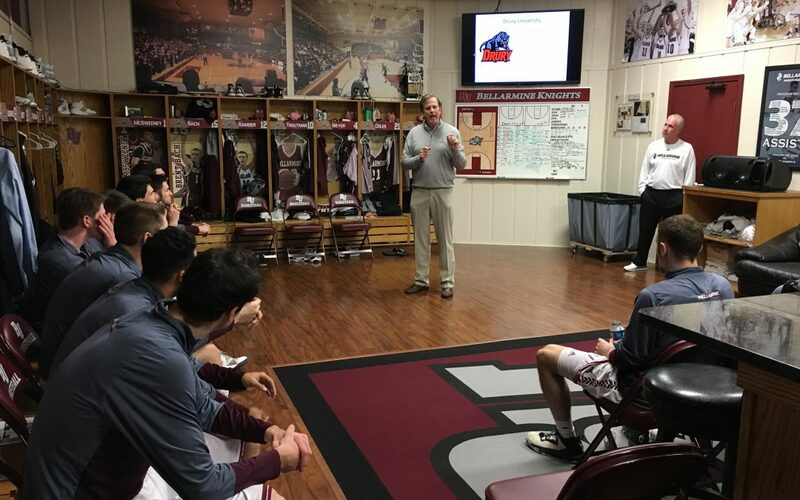 First, I was a scholarship aid athlete at Bellarmine as a golfer for Coach Lally in the late 1980’s and we won quite often and seemed to help move the program to another level. My teammates were some of the best men I ever knew but I am more excited about this year’s men’s team because they could win the 1st national championship in men’s golf ever at BU! The whole place is on fire!! 1. There were Alumni from the first graduating class and early star athletes like former AD Jim Spalding and many others sitting next to us who were in tears when it happened. 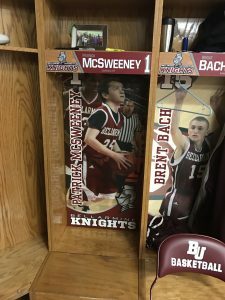 It seemed like this victory cemented the “BU have arrived nationally” to many of the early pioneers of the university who chose Bellarmine as an early risk taker who knew it was going to be “a special place”. 2. 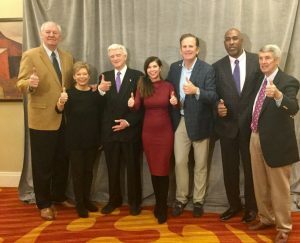 Being on the Board of Overseers for over 8 years, I remember the first day they brought Coach Davenport to our board meeting to introduce him as our new men’s head coach. We had been a “non factor” in college basketball for quite some time, but we knew Coach could bring true passion to the program. 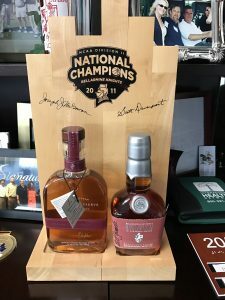 Most of us knew it was just a matter of time and it would happen at the highest integrity, because Coach Davenport always wins at all levels and plays by the rules. Since then, we have stayed in the Top Nationally year in and year out and almost take it for granted, but the other night, I had the great opportunity to be the Honorary Captain of the 2016-17 men’s basketball team. To be up close with this special group of young men, I noticed that they just seemed very different, which took me a while to reflect and define it. Then it hit me, yes, Coach D and his staff prep a game like very few in the D2 circles, but it was the “unselfish love and unity” that really surprised me. They have BIG stars, but it was “the 15 Strong” tag line memorialized by Pat Riley in his last coaching championship with the HEAT that I witnessed. And Bellarmine had that exact same element where you can’t tell the difference between stars and role players. You see it in warm ups, you see it in the body language that shows through in each player, you witness it with Patrick McSweeney presence around the locker room that reminds all of the players to “cherish your time” and “to play for something bigger than yourself” and there are no guarantees in life except the “here and now”, which resonates throughout the locker room. There has been much research on mental toughness and team dynamics in regards to what makes individuals and teams perform at our optimal level. I realized this team has that high mental confidence level that is that “X factor” that is hard to label. I thought about Dr. Gio Valiante, the famed Rollins College psychology professor, who found that perfect intersection where athletes who establish the perfect blend of “humility and gratitude” as the primary drivers and motivators to develop the deepest confidence levels at a high correlation level. These athletes regularly overcome pressure with somewhat ease, which he attributes that the “gratitude” helps the athlete maintain a high level of joy, even under great pressure. Those two mental modes – gratitude and humility – were hardwired in the game day practice (as players explained their routine), the dinner before (celebrated with grace), the loose but intense warm ups, and in every aspect of the game by each player coming in and out of the game – they all played with great humility and deep gratitude that was the difference maker between this team and everyone else in the country. 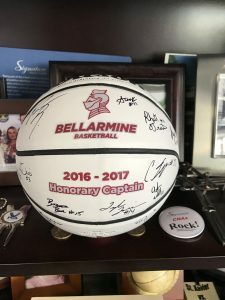 I have seen many individual athletes have it, but never on one unified entire team until last week – Bellarmine has it! Come to Sioux Falls, South Dakota on March 25th and watch them cut down the nets with gratitude and humility! Here is a reflection by Joe Steier on the passing of Clarence Clemons, who was a personal friend to the Steier family. The piece was published by LEO Weekly, an arts and culture publication in Louisville.